TORONTO, Feb 1, 2016 /CNW/ - Today, iconic brand Tim Hortons announced a landmark commitment to source only cage-free eggs for its restaurants in Canada, the US and Mexico by 2025. Tim Hortons' is responsible for approximately six out of every ten egg sandwiches sold in Canada – about 288 million per year. And while this announcement is the latest example of a company making similar commitments to go cage-free, it is the most significant in terms of the number of Canadian hens impacted. "Tim Hortons' announcement today is the most substantial cage-free sourcing commitment made by a Canadian restaurant chain we've seen to date," says World Animal Protection Canada's Executive Director Josey Kitson, "and will positively impact the lives of more than 650,000 laying hens in Canada alone." Right now, the vast majority of the more than 28 million Canadian laying hens are kept in conventional battery cages where each hen lives in a space smaller than an iPad. They have little room to stretch their wings or move around freely. 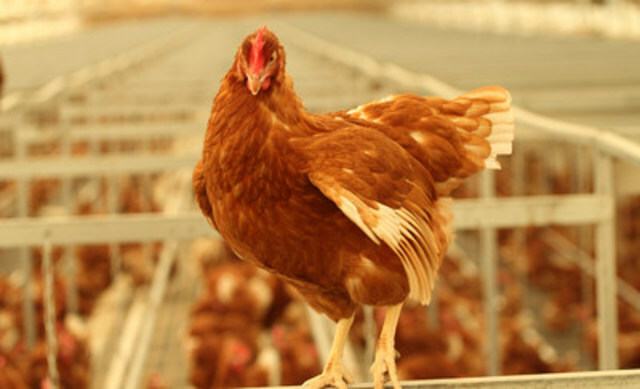 However, in typical cage-free barns, hens are able to express some natural behaviours like walking around, laying eggs in a nest box and perching. "It's the right thing for Tim Hortons to do for hens, for their customers and for themselves. We know that Canadians want responsibly sourced food. More than ten thousand Canadians have taken our Choose Cage-Free pledge and companies like Tim Hortons and McDonalds have taken notice," continues Kitson. Tim Hortons' commitment to source cage-free eggs for its more than 4,500 North American restaurants will require a substantial investment from Canadian egg producers. "This commitment, by such an iconic brand, provides direction to both producers and other food companies," says Kitson, "the future of egg production in Canada is cage-free."